SunSport Coached Ronan Anderson ahead of Celtman! How has training been going this winter? Training went well this winter. In Aberdeenshire its sometimes just a matter of getting out and getting it done regardless of the weather. I actually don’t mind training in the winter although the Beast from the East did force me into the garage and on to my turbo trainer unfortunately. Is this the first time you have competed in CELTMAN! 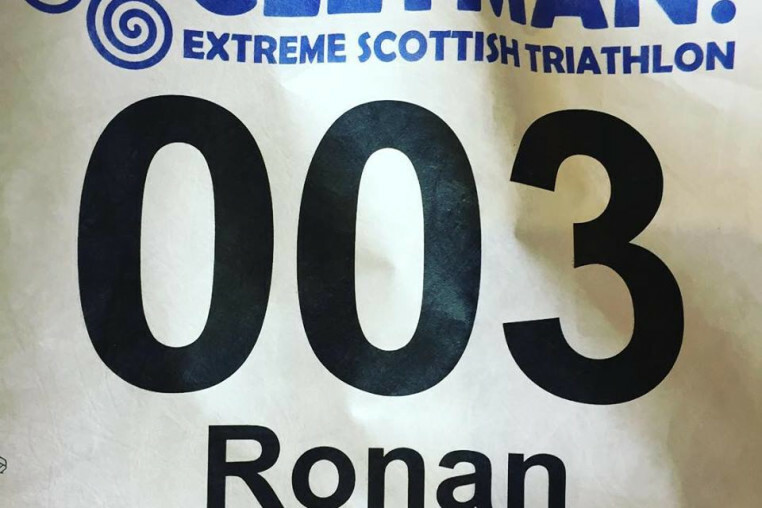 Extreme Scottish Triathlon? If so what other races have you done? This is the first time for competing in the Celtman. I’ve done a few other long races and half ironman distances but this is by far my greatest challenge yet. Why have you chosen such an extreme triathlon to compete in? What specific training have you done for this race? I roughly do 2 swim, 2 bike and 2 run sessions a week and have concentrated on building the distance and endurance throughout the year. Having a full-time job and three children I have to fit my weekday sessions in usually before work while keeping the weekend for the longer sessions – these are usually early mornings too so that I can get back home to spend time with the family. My wife is also a keen triathlete so we have to juggle our training around valuable family time and the children’s activities. When did triathlon appear on your radar? How long was it before your first race? I had always loved football when I was growing up and played a lot of it but after getting injured too many times I finally gave it up and turned to running and cycling. I did a few cycling and running events before completing my first triathlon in 2015 and then was hooked! How have you found using Sunsport Coaching affiliated products Veloforte & WorksNaturally creams within your training? Veloforte bites are my go to choice when on the bike. Quite simply because they’re delicious and they provide me with all the energy I need. Lots of folk in my cycle club, Montvelo CC, swear by these bars now. The Works Naturally slipstream anti-chafe cream is always one of the first bits of kit I pack for a race. Reason being is that I can apply this at the start of the race under my wetsuit and it's still in place and effective during the bike and run. No more sore bits!! How have you found being coached by SunSport Coaching? What do you find as the benefits of having a coach? Stuart at Sunsport has quite simply transformed me as a triathlete. Without his guidance and structured plans, I’d never be able to sustain the motivation required to compete in events such as the Celtman. I think that motivation and consistency is key to performing well and Stuart works with me to ensure that the training sessions are structured and achievable in amongst my busy family life and work. What is your strongest discipline? Before working with Stuart, I would’ve said cycling but since he’s started coaching me I consider myself to be able to hold my own in any of the three disciplines. What is your favourite training set? I honestly love them all. Sometimes while in the Loch open water swimming I think it’s the best place to be in the world but then I find myself in a complete place of happiness while running through local hills. I do a lot of long distance cycle sessions when travelling somewhere with my family. I usually set off early in the morning to wherever we’re going on my bike and my wife will follow later with the kids in the car. There’s something about cycling from A to B, rather than doing a loop, that gives a much more feeling of satisfaction. The longer the sessions the better for me. What are you most looking forward to on race day? And what are you NOT most looking forward to? I actually look forward to all the disciplines, even the swim in amongst the jellyfish. I know I’ve trained hard throughout the year so the thing I fear most is a mechanical failure on the bike. Oh, and there’s beer at the finish line…..that’ll get me through. Do you have any other events planned for this season? After a well-deserved recovery period I’ll be doing the middle distance Scottish Triathlon Champs in Aberfeldy in August and then the Ben Nevis Braveheart Triathlon in September. The Braveheart includes a run up and down Ben Nevis!! Thanks Ronan and good luck!